AVS Forum | Home Theater Discussions And Reviews > Video Components > Home Theater Computers > The Inconvenient Truth about SPDIF Input! USE OUR HTPC AS A REPLACEMENT FOR A RECEIVER! Because we don't want another piece of hardware sitting in our media rack (or ANOTHER remote). Because we don't want to spend the extra money on a receiver. Because a computer SHOULD be able to handle it. Well people, I am here to tell you that, after my exhaustive search for this holy grail, I have come to the conclusion that it is (at present) NOT COMPLETELY POSSIBLE! Note: This is referring mostly to a computer running Vista. Source outputting an AC3 stream ---> SPDIF input on your computer ---> 5.1 speakers connected to your computer. Source outputting an AC3 stream ---> SPDIF input on your computer ---> AC3 Software Decoder ---> 5.1 speakers connected to your computer. Source outputting a 2 channel PCM stream ---> SPDIF input on your computer ---> L & R speakers connected to your computer. Source outputting a 2 channel PCM stream ---> SPDIF input on your computer ---> Audio signal remixer ---> Audio 5.1 speakers connected to your computer. NOTE: This solution will result in the audio being ~1 second behind the video . Source outputting a 2 channel PCM stream ---> SPDIF input to your computer ---> Media Player Classic (using "Open Device") ---> Audio 5.1 speakers connected to your computer. NOTE: This solution does NOT cause a noticeable audio delay! Although you may need to OCCASIONALLY restart MPC if the audio starts to lag. However, this does not occur frequently (at least on my Media Live Diva HTPC with an AMD Phenom Triple Core 2.4 and 4 GB DDR2 RAM). Almost NO sound cards exist (except maybe the ones listed at the bottom of this post or possibly the legacy Creative cards that support the KX project drivers) that will decode an AC3 stream passed over SPDIF. Realtek has NEVER supported (and I doubt will ever support) passing an AC3 stream from SPDIF input to a directshow decoder (such as AC3Filter). This is the case even though the Realtek chipset is able to recognize that the signal it is receiving IS, in fact, an AC3 signal. 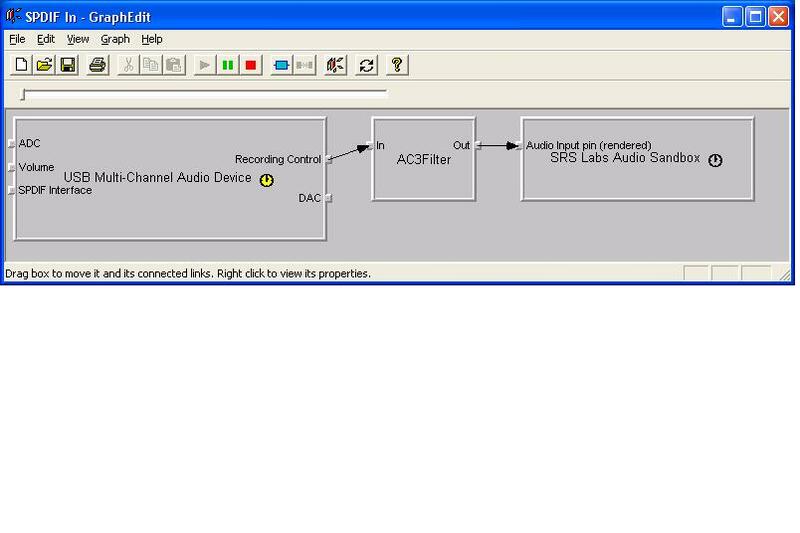 You can verify this on your own by simply plugging a device that is outputting Dolby Digital directly into the SPDIF input and goto the Realtek HD Audio Manager ---> Digital Input tab ---> Digital Audio Input tab. You will see under Sample Rate: "AC3 48Khz". Creative's X-Fi (which has a hardware dolby digital decoder onboard) doesn't support decoding an SPDIF input and passing it to the directsound to be output. They only use the hardware decoder to decode an AC3 stream from a file (or DVD). It has been reported that the X-Fi Elite Pro had the ability to decode AC3 streams from the SPDIF-IN, but this feature seems to have stopped working as of Vista. The Asus Xonar HDAV 1.3 was also rumored to be a possible solution, but it looks like this card ALSO does not support decoding AC3 streams through SPDIF input (see the "official" thread for this sound card located in the references section). Even though chipsets, like Realtek, can recognize the type of stream they are receiving, they will not pass the signal as AC3 to directshow filters. Instead, it just defines the signal as a 2 channel PCM signal. You can verify this on your own by creating the following graph in graph studio and then checking the properties of both the capture device (under the capture tab) and the AC3 filter (under the input tab). No audio will come out of your speakers (or if it does, it will just be a bunch of popping noises). The issue here has to do with the directshow messaging flags that are set by the audio chipset specifying the input signal type. In the case of the Realtek chipset, while it can recognize the type of signal being input via SPDIF, the chip has been designed to "block" that signal from being accessible by software decoders by setting the directshow messaging flag to indicate that the signal is just a 2 channel PCM steam (instead of an AC3 stream wrapped in a 2 channel PCM stream). As a result, for most of these sound cards, the only option you are given is to simply pass-through the AC3 signals to the SPDIF-Out. 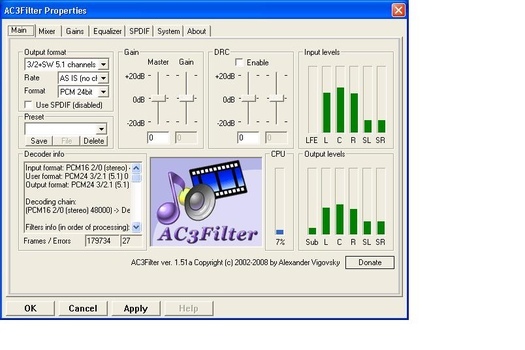 The signal is still technically accessible to your computer (as demonstrated by the popping noises that come out of your speaker), but since software decoders use the directshow messaging flag in order to determine HOW to decode the signal, the result is that software like ffdshow ends up decoding the signal incorrectly because it thinks it is a standard 2 channel PCM stream instead of AC3. If you were to design your own software solution that just ASSUMED the SPDIF-In signal was AC3, then you might be able to get something to work. However, then you would have the problem that ALL signals sent to the SPDIF-In would HAVE to be AC3 (and more specifically, would HAVE to be either DD or DTS, but not both). The problem, I think, is mostly legal. The RIAA and MPAA don't want you to be able to decode DD/DTS (or better) signals from an input stream on a computer because then it would allow you to make PERFECT digital copies of their media without having to "break the law" (by bypassing their encryption). My guess is that the music and movie industries are using the DMCA to threaten the hardware manufacturers and none of the hardware manufacturers want to risk being sued. Even if we do figure out a way to write our own filter that will ignore directshow messages being sent from the capture card and just decode whatever stream is coming from the SPDIF-IN as if it were AC3, we are still going to have to deal with the fact that it is physically impossible to real-time decode an AC3 stream using software without incurring a noticeable delay. The reason software decoders are able to keep the audio synced with the video on a DVD is that the decoder is decoding the audio several bits ahead of the video to mitigate the inherent latency that comes with software decoding. Obviously decoding ahead of time isn't possible with an SPDIF input stream. You would have to delay the video either from the source or on your TV to correct the lag (which I don't think is possible on any TVs I know of and probably not possible on MOST source devices either). Although there is always the issue of lag with software decoding, computers these days could probably still software decode fast enough for the sound to sync basically correctly (although a slight lag will inevitably still exist). Recall that Media Player Classic is actually able to recode a 2 channel PCM stream into 5 channels without a noticeable delay in the sound. Decoding an AC3 stream is really no more time/processor intensive then recoding a 2 channel PCM stream, so it is feasible that a software decoder (like ffdshow) could handle it in "real enough" time. EDIT (10-25-2009): EVERY TV I have looked into that is equipped with an SPDIF out down converts AC3 streams coming in from HDMI to 2 channel PCM before the signal is passed out the SPDIF. This doesn't really directly relate to the issue, however it would be the easiest method to handle switching between multiple devices that are sending AC3 as well as extracting the stream from an HDMI signal. Unfortunately, TVs down convert the signal (to be played on their built in speakers regardless of whether or not you are using them) and do not provide an option to simply pass the audio signal from HDMI to SPDIF. I think the primary issue here is that HDMI allows for the transfer of the new audio formats (TrueHD, DTS-HD, etc.) while SPDIF cannot transport those signals. However, when the HDMI is carrying an AC3 signal (as most of them do these days) there is no reason why a TV couldn't have some sort of "check" that would see if the signal can be passed to SPDIF. According to dolby, DD+ is a derivative of AC3 DD (I am going to assume that TrueHD is as well...but don't quote me on that) and one can VERY easy to strip the AC3 DD stream from a DD+ signal. I have no idea why TV companies would want to waste precious processing power on down mixing audio streams to 2 channel PCM if they don't have to. So there are the reasons I have come up with as to why a computer cannot act as a replacement for a receiver! I guess we are just going to have to settle for the fact that, until sound cards start coming equipped with a hardware decoder that will do a real-time decoding of the SPDIF input and pass that signal directly to a directsound device (which I wouldn't hold my breath on), we will not be able to junk our receivers. Please post your thoughts on this topic. I will update the top of this thread as more information about this issue comes to light (i.e. if new limitations are discovered or if the aforementioned limitations are resolved). I would hope that (eventually) this post might become a sticky so that people won't search in vain for a solution on how to do this when that solution does not exist. A discussion on the new Media Live Diva which prompted my writing this new thread. Another forum topic relating to this issue. A patent by Hughes Electronics which provides a lot of information on how AC3 is wrapped into a PCM stream. A good forum topic relating to limitation #3 and the Creative X-fi sound card. The wikipedia page on Dolby Digital Plus providing useful information relating to the passing of signals through HDMI. The product manuals for Sharp Aquos. Page 13 specifies that the TOSLINK outputs "PCM Audio". 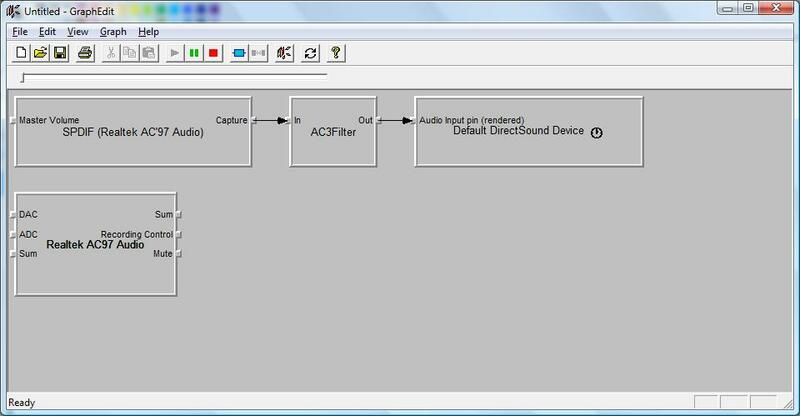 Another forum thread related to the search for sound cards that will decode AC3 through SPDIF. AC3Filter release notes page that specifies that decoding of SPDIF-IN signals is planned for the "future". Another forum thread related to this topic. Yet another forum thread related to this topic. A GREAT thread topic that shows that capturing raw AC3 streams from an SPDIF Input IS possible...Unfortunately it doesn't really solve our problem though (just shows proof-of-concept). A reference from desertdome about the X-FI Elite Pro, which may be a solution for people running XP! Recent ticket item on Creative's Beta forum. Seems that Dolby/DTS decoding is still broken in Vista. "Offical" ASUS Xonar HDAV 1.3 thread. If you have any more useful references related to this topic, please let me know and I'll add it to the references section. The Creative X-Fi Elite will decode AC3 streams passed over SPDIF. See the X-FI Elite Pro - Is it an HTPC Pre-Pro Replacement? thread for more information. yeah I wouldn't ever try to use a PC as a replacement for a reciever, it's just never going to work as well. I'm sorry I forgot to mention that I am mainly referring to running in Vista. If you look toward the end of the link you sent me, you will see that Creative essentially removed decoding via the spdif input for the X-fi Pro Elite in Vista. I appreciate the link though. I will add it to the references section. I have to ask....WHY? Receivers are dead cheap, and brain dead easy and reliable. Why would you ever want to do the same with a buggy PC? Because the MSI Media live motherboard with 5.1 amp is an amazing board with incredible sound, and not having another device, remote, etc. in the loop would be nice. Sorry I really can't see the point of SPDIF-IN especially for AC3, I mean you might as well just play it all on the PC directly anyway. DVD and even blu-ray drives really don't cost much. Audio from a game console? I wanted a similar configuration, with even more decoding/encoding. What I wanted is to be able to hook up headphones to my receiver and decode the optical 5.1 output to headphone with HRTF (head-related transfer function) such as Dolby Headphone. I have this working! And I am doing it on a Compaq M300 500MHz Pentium III laptop with 128MB RAM that I literally rescued from a dumpster (running XP Pro). First of all, I want to straighten out a mis-conception shown in this thread. The SPDIF audio will always appear as just 2 16-bit PCM channels. Dolby Digital and DTS are encoded as compressed data within these two channels. A more detailed explanation can be found on the AC3Filter site, but just know that your SPDIF input *should* be 2 channels. The interface I used is based on the C-Media CM6206 IC. It is a Sabrent 8-Channel 3D USB 2.0 External 7.1 Surround Sound Box USB-SND8. It has optical SPDIF input and output and I purchased it for $24.99 delivered. I connect the optical output of my receiver to the optical SPDIF input of the Sabrent. Using Graph Edit, I connected the Sabrent's WDM Streaming Capture Device to AC3Filter version 1.51a. Set the output format of AC3Filter to "3/2+SW 5.1 Channel". Then connected AC3Filter to the SRS Audio Sandbox! That's it. The SRS Audio Sandbox renders the sound and your output options are whatever you would like. I use the Headphone 360, and it is fantastic. Now, the only down-side is that the C-Media chip supports SMCS on SPDIF. My Dish Network receiver decodes fine. But I found that when I play a purchased DVD in my Toshiba D-RW2, it apparently sets SMCS enable and I get exactly NOTHING on SPDIF through the CM6206. A rip/copy of the DVD on recordable media works fine. Talk about digital rights management getting in the way of legitimate uses! I need to make a copy of my originals! Hope this helps others to get this working! Well people, I am here to tell you that, after my exhaustive search for this holy grail, I have come to the conclusion that it is (at present) NOT POSSIBLE! No offense guys, but this has been known and discussed here for years. Don't bother trying to build a prepro out of a PC unless you like pain. Good guide, but why you (or anyone else) ever wanted to use a HTPC instead of a receiver is far beyond me. It's all about trying to get that audio out of the HTPC and into the receiver as efficiently as possible these days . As to the reason, It'll save a couple hundred bucks, another remote to keep track of and 2 or 3 cables in my already cluttered A/V rack. My current 5.1 setup is about ideally sized in terms of volume for my room and my PC has a lot of options in terms of setting up the speaker distance, EQ, crossover point etc. so why add another redundant piece of equipment and either buy adapters for my speaker connections or new speakers if it's not necessary? The only thing I'd be adding a receiver for is for my ps3 and it's not worth the money for me as I'm more concerned with the video than audio, which is why I'm only running it in stereo for now. The main concern with me is actually getting the audio through the sound card instead of in pass-through mode so I get the crossover functionality (and speaker fill). I don't even care if it's not actual surround sound and to be honest I don't even care about speaker fill, but the fact that I can't get it to go through the crossover and pull the bass out of the satellites limits the volume I can actually send to the speakers. Also, it looks like it's been figured out so I'll try it when I get home and see if it actually works. It doesn't really work in Vista, I think it may be AC3Filter not working. 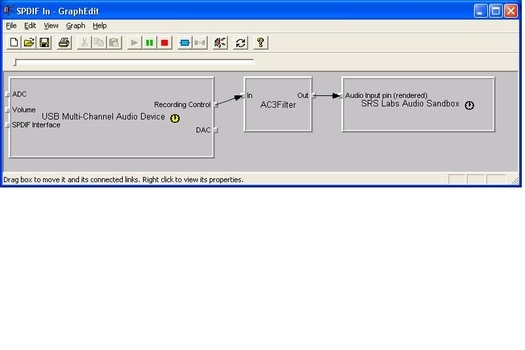 I had to use the SPDIF audio capture device to get it working as no SPDIF shows up on the Realtek WDM capture device, just ADC and DAC (see pic). AC3Filter shows no input when I switch to DTS or Dolby Digital (nothing, not even on 2 channels). AC3Filter does show 2 channel input and adds in the center channel but no sub and the sound is delayed about .5 seconds, I tried to adjust the lag in AC3Filter but it doesn't seem to have an effect. I'll keep messing with it but it doesn't look good. You will always have lag using filters in shared mode (through the windows mixer). For no/minimal lag, you need to use an app that supports exclusive mode. If all your media is sourced from the HTPC (internal DVD or BD, streamed TV from HDhomerun) plus ripped files from HDD (i.e. no external drives or cable boxes), shouldn't the analog outputs (onboard or sound card) send 5.1 to your external amp? Therefore, no need for a receiver....right? Yes, that works fine. This tread is talking about accepting/passing digital (specifically DD/DTS) audio from external devices, like game consoles, cable boxes, etc. I think the Xonar HDAV 1.3 can. Is that a miniPCI board? If so, I may actually be able to cram it into my case as that's the only slot I have left open. The specific use would be to take optical or hdmi from a ps3 and send to the 5.1 speakers hooked to the computer. I'd much rather add something like that then buy a receiver and all of the associated cabling to hook it up...If I could run the HDMI in from the ps3 and run uncompressed sound, even better but I'm not about to invest $220 without confirmation that it'll work as I wouldn't be using the bulk of the features (no point to putting a BD drive in the PC and using it as a player if I have a ps3). I'm going to see if I can find some reviews, I have a sneaking suspicion that it'll do it but not real-time which would make it worthless for gaming . Thank you for sharing. I have been racking my brain for the last 2 hours trying to figure out how to decode a dd or dts signal sent from a xbox 360 to a MSI Diva board. Any one interested in buying a diva 7.1 pre-out board? (half kidding) Not being able to decode a incoming digital signal is a HUGE hit against this board. While this may have been known for a long time, its news to me. Thanks again for sharing. Hey everyone. I am writing this post as a little bump to my thread. I'm glad to see people have been discussing this still in my absence. I am sorry for being gone so long. My HTPC went belly up and it took me 4 months to get it back up and running. I'll admit a large part of the time was just procrastination, but it is good to be back. Anyways, I have made a little update to my thread to let you guys know about a "solution" to the audio delay problem, using Media Player Classic, that I actually discovered a LONG time ago. It doesn't solve the Dolby decoding issue, but it has worked pretty well for me as a "good enough" work around to the problem (i.e. getting sound out of all 5.1 speakers without a noticeable audio delay). Put me in the camp of NEVER using a PC as a receiver. Why? When a receiver already does its job so well? Noisy PC, Generic PC that can crash, be virused, running multiple applications and them not playing nicely together. No SireeeBob, the right tool for the right job. Thanks, but I don't think this thread is for me. Cool. I'll give that a try - good post.